A young Gloria Gossard walks her bike. Photo courtesy Tread of Pioneers Museum. Steamboat Springs, CO - Glamorous, gracious, original: Memories of Steamboat Springs philanthropist Gloria Gossard are warm, personal and, sometimes, outrageously funny. When she passed away at age 88 in 2010, Gloria left $9 million to 18 Colorado nonprofits, 13 of which are in Routt County. While certainly willing to formally state their appreciation for her unparalleled generosity to the community, what people who knew her really want to do is share their stories. An elegantly dressed woman with a fashionable hat who smoked cigarettes from a holder, most people remember Gloria driving a boat-like Cadillac convertible. She advised that a lady should look her best every time she leaves the house, especially in a small town. And indeed, even as she stepped smartly from her Caddie to retrieve her mail at the post office on a regular basis, her hat, purse, dress, accessories and shoes always matched. Style came naturally to Gloria, whose father, H.W. Gossard, founded a corset company in Chicago in 1902, having been inspired by actress Sarah Bernhardt in Paris, whose figure was transformed on stage by a specially designed corset. In 1922, he invented “the Gossard,” a front-lacing corset. “Modern” women hailed his design as liberating because old-fashioned corsets laced up the back, requiring a woman to have help dressing. Today Gossard Lingerie is one of Europe’s most recognized brands, not unlike Victoria’s Secret in the U.S. The company won the U.K. Lingerie Award in 2012. Gloria Gossard. Photo courtesy Tread of Pioneers Museum. H.W. invested profits from his lingerie business in ranchland and moved his family from California to Northwest Colorado in the early 1930s. One of the principals in the development of the city of Steamboat Springs, he renovated the downtown hot springs and organized a “mile of roses” along Lincoln Avenue, the forerunner of the flower barrels that line main street every summer. After Gloria’s father “dragged her by the heels” from the sandy California beaches, "My feet were strapped to two over-long wooden slats and I was turned loose on frozen water. I was the novice. Everyone else had been skiing for years. So it was adapt, learn to ski or be an outcast. That's the story of the West: One has to do what one has to do," Gloria later recounted. Eventually, Gloria came to share her father’s enthusiasm for Steamboat, but she was more interested in its future than its past. “The only thing good about the good ol’ days is that they’re old days,” she said. “She loved the history of the community, but she was all about today and what it could be down the road,” says banker John Kerst. Later in her life, even as people and places were fading in her memory, music still resonated with her. 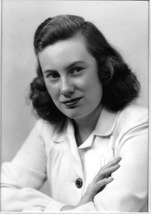 Strings Music Festival founder Kay Clagett said once that Gloria attended more Strings concert than almost anyone. The story goes that right up until she was too incapacitated to leave the house, Gloria attended concerts — often bringing both her caregiver and her dog along. Strings Music Festival is the largest recipient of Gloria Gossard's generosity. Photo courtesy Strings Music Festival. Another of Kramer’s favorite “Gloria memories” is of her fascination with water. Every spring, she would cruise the roadways along the Yampa River, checking the water level. She’d often stop by the Depot to visit along the way. She was from a ranch family, and she knew how crucial a good water year is in Northwest Colorado. Lots of old friends, Kramer among them, describe Gloria’s fun-loving attitude. She didn’t let anything get in the way of a good time. Take for instance the night she had plans to go out but found her driveway blocked by a parked car. She called the neighbor its driver was visiting and asked that the car be moved. She waited, apparently impatiently, for a response. When none occurred, she put her big sedan in reverse, nudged the offending vehicle out of the way and continued on her way. She was often invited to parties by Kevin and Jane Bennett, who live in Charlotte Perry’s old house, of Perry-Mansfield fame. Early in their entertaining days, the Bennetts didn’t make solid contingency plans in case inclement weather forced their guests inside. Although he can laugh now, Kevin recalls being appalled when he saw Gloria, dressed to a T as always, perched on a toilet seat — the only available chair — balancing a plate and eating her dinner. “She was happy as a clam, and she had that twinkle in her eye,” he recalls. When she was on break from Steamboat Springs High School, Gloria would tell her parents she was going downtown to a dance, then hop in her car with friends and drive to North Routt. "They had magnificent barn dances at Hahn's Peak," she said. "I think they were a boon to my mother and father, because at least we kept out of their hair." Gloria was not afraid to go her own way. When she built a new house, she wanted a contemporary design that was light and airy with commanding views. She didn’t want traditional Western architecture. The two struck up a friendship that lasted throughout Gloria’s lifetime. Cogswell remembers sitting in her breakfast nook when she was mourning the death of her brother, Bill, who had always looked out for his sister. “Who will take care of me now?” she pondered. Innocently, Cogswell raised his hand. On that day, he vowed that he would watch out for her and see to it that she could stay in her home as long as possible. “I had no idea what it meant to be a long-term caregiver,” he says. Despite the challenge that promise posed, Gloria got her wish. In her last years, she needed round-the-clock care. “We had a great group of ladies looking out for her — that lasted six or eight years,” he says. True to his word, Cogswell stayed by her side to the very end. “I have years and years of great memories,” he says. Thanks to Gloria’s lifelong generosity to the town she loved so much, the community, too, will remember her for a long time. We have Gloria Gossard House (Tread of Pioneers Museum), Gloria Gossard Parkway (an as-yet unfinished road on the west side of town), the Gloria Gossard Atrium (Yampa Valley Medical Center) and Gloria Gossard Park. This summer, the Morning Gloria trail will connect the front and back sides of the Emerald Mountain trail system. These are only a few of most visible tributes to Steamboat’s biggest benefactor. 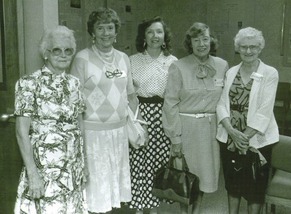 Gertrude Farrell, Doris Gooding, Christine McKelvie, Gloria Gossard and Addie Zimmerman at Routt Memorial Hospital's 40th Anniversary, 1990. Photo courtesy Christine McKelvie, Yampa Valley Medical Center. Education, the arts, health and human services: Steamboat would not be what it is today without Gloria’s generosity. Singling out one gift as the most significant is impossible, but one that stands out is the land on Emerald Mountain that she and her brother gave to the city. As one might expect of the Gossards, it came about in unusual fashion. 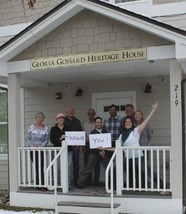 Gloria Gossard's gift to the Tread of Pioneers Museum enabled expansion plans, including the Gloria Gossard Heritage house, its new collections facility. Photo courtesy Tread of Pioneers Museum. The city had been asking Bill and Gloria for years to donate a piece of land that would further development of the Howelsen Hill Sports Complex, recalls Kevin Bennett, who was a city council member at the time: “She was perturbed at council’s demands. She got tired of all the asks and sold the land to a private buyer.” The city, in turn, raised the funds to buy the property. “Gloria was excited that we actually did it.” The rest of the Gossards’ Emerald Mountain property transfer came directly from the siblings. With Bill and his wife, Carol, Gloria loved spending time on Emerald Mountain. One day when she was hiking there, she came across a young family who exclaimed how much they loved the mountain, not knowing she still owned much of the property. At that point, she later explained, she decided to give 120 acres of prime Emerald Mountain land, including the quarry, to the city. Bennett called the gesture "one of the most incredible gifts this community has ever seen." Two-thirds of Steamboat’s homes look out over Emerald Mountain, and it was Gloria’s wish that when they did, they would see only emerald green in summer or white in winter. Her generosity allowed that to happen. Eighteen Colorado organizations were named beneficiaries in Gloria Gossard’s will. Thirteen of them are based in Routt County. 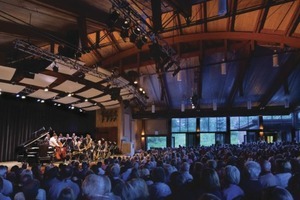 The gifts totaled more than $9 million, with four organizations, Strings Music Festival, Healthcare Foundation of the Yampa Valley, Colorado College and the Steamboat Springs Arts Council, receiving more than $1 million apiece.